Well it’s the end of Week 3 for Create with Connie and Mary Spring Collection 2014 and on Saturday we have a special challenge. This week it is a fun Sketch Challenge and I don’t know about you but I just LOVE banners! Not only do I love banners but I also LOVE the Retro Fresh dsp and Just Sayin’ set. So many fun thing coming all together on this! Three Banners – Retro Fresh dsp and the Banners Framelits. Layer onto card front. Add piece of Crushed Curry Chevron Ribbon. Stamp greeting using Versamark on Coastal Cabana cardstock and emboss using Early Espresso embossing powder. Cut out using matching Bubbles Framelits and add to card front using dimensionals. Finish with arrow from Essential Wooden Elements. 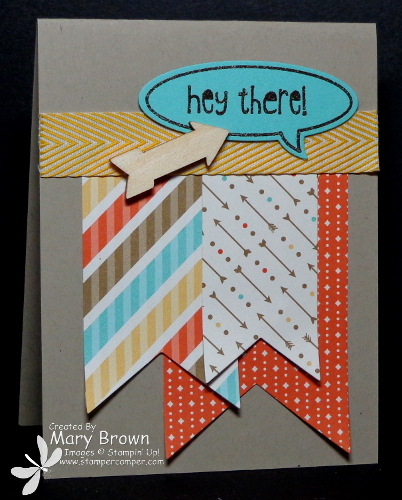 So check out the fun creations from the Create with Connie and Mary Design Team! 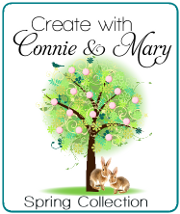 We have just finished Week 3 of Create with Connie and Mary Spring Collection 2014! It is NOT too late to join and get GREAT ideas for products from the Occasions Mini and Sale-a-bration Brochure. You can still check out Preview Week where you can get a taste of what Create with Connie and Mary Collections are all about! Join now for only $29.95! You get 4 weeks of exclusive projects (not shown anywhere else on the Internet!). One week is are Card “Create”tions week (6 days of cards…each designer sharing 4 cards from their chosen set), one week is all about Sale-a-bration and the other two are with the products from the Occasions Mini. Check out Create with Connie and Mary to learn more and to see the great projects by the design team. This entry was posted in Create with Connie and Mary, Spring Mini and tagged Just Sayin'. Bookmark the permalink. This card showcases the Retro Fresh DSP so well and the word bulle gives a great focal point. Love the addition of the arrow too – I need to get me some of these! Sorry that should read ‘word bubble’! Love how you use the Just Sayin’ set! Too fun! And these colors are so fun, too! A great card for anyone! !